Anuj Karpatne is an assistant professor in the Department of Computer Science at Virginia Tech. 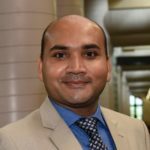 He received his Ph.D. from the University of Minnesota with Vipin Kumar in September 2017. Following graduation, he was a postdoc with Kumar until joining Virginia Tech in August 2018. His research explores how data mining and machine learning methods can accelerate scientific discovery and address some of the major challenges facing our society. A primary focus of Karpatne’s research is to advance the paradigm of theory-guided data science, where machine learning methods are deeply integrated with scientific knowledge (or theories) that underlie real-world phenomena in physical and life sciences. An overarching goal of this paradigm is to develop generalizable and physically consistent machine learning methods that can augment current gaps in our understanding of physical processes by effectively using physics and data. Karpatne’s prior research builds the foundations of this paradigm and explores its applications at the intersection of food, energy, and water. He is teaching an advanced topics course on Machine Learning Meets Physics this semester, which is aligned with his research interests.